Everyone enjoys the random episode of The Fresh Prince of Bel-Air that can usually be found with a little channel surfing. A lot of us grew up with Will, Carlton, Uncle Phil, Aunt Viv 1 & 2, Hillary, Ash and Geoffrey. All likable characters and the show itself was funny and pretty wholesome. It's easy to understand why the show had a solid six season run. I don't know that I've ever seen an episode I didn't enjoy, but there is one episode that does stand out from the rest as my favorite. It was a Season One episode entitled "Courting Disaster" which aired in November of 1990. Why this particular episode? That's easy, the Isiah Thomas cameo. Isiah Thomas was my hero growing up and I could make a case for me being his biggest fan ... my first born son's name Isiah. I'm serious. If you look at when this episode came out, November of 1990, Isiah had just led the Pistons to back-to-back championships the previous June and was named NBA Finals MVP. Needless to say my fandom was on a definite high. I recorded the episode on VHS and would watch it like every day after school. Not always the entire episode, sometimes just up until Will day dreams that he's taking on Zeke in a commercial for his own signature "Air Fresh" sneakers. Whenever a friend would come over I'd pop the episode into the VCR like it was something that once viewed would change their lives. I mean the whole episode is great don't get me wrong, but the Isiah cameo should have won it an Emmy or something. These cards are inspired by the 1990-91 NBA Hoops set. 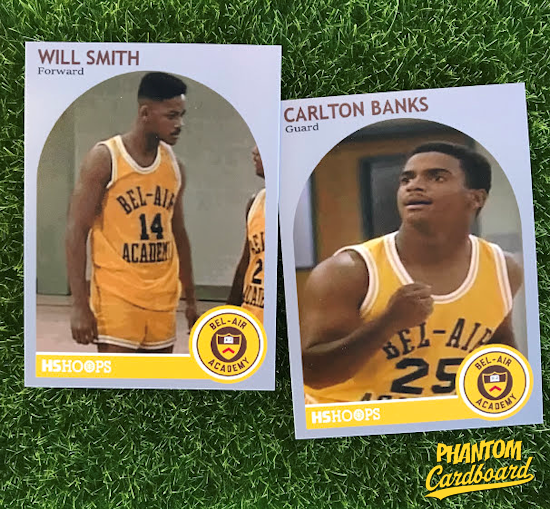 I previously used this template for the "Zack Morris" card I did and the "HS Hoops" element I made for that card also fit this perfectly and the cards were finished off nicely with the Bel-Air academy logo. I would have loved to have been able to add a "Coach Smiley" card but I just couldn't find a decent picture.